Yesterday was our annual “spray for borers day”. This is an event known mainly to irisarians in the USA who live east of the Rocky Mountains. Quite why the iris borer has never crossed the continental divide to torment iris growers in the West still puzzles me and seems entirely unfair. 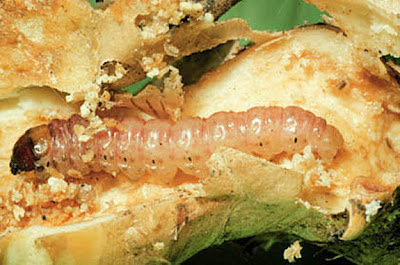 As we Easterners know so well, the iris borer is a moth that lays its eggs in and around iris patches The little larvae (caterpillars) hatch out in the first warm days of spring and start eating the iris foliage. If that was all, it could be bearable, but very soon after they start feeding, they chew their way inside the leaf and head down into the rhizome, there to cause their destruction hidden well away from sight. A young iris borer is revealed as it starts it's journey of destruction. Despite some “common knowledge” to the contrary, iris borers quite happily feed on many beardless irises (including Siberians) as well as the bearded ones. They grow to be large (2” long) and ugly, and they have enough appetite to destroy whole rhizomes, particularly the smaller ones of irises like Siberians. Their feeding damage also opens up the rhizomes to bacterial rot diseases. Not only that, they bred freely, are adept at locating irises, and unless kept under good control can play havoc with iris plantings. They are not an adversary to underestimate. So how to keep on top of these insects? The usual advice is to maintain a clean iris patch, removing old leaves and other materials where eggs may be laid. Probably this helps but it is not sufficient alone. For one reason, the small larvae spin silk threads and can travel quite long distances blown on the wind – they are not just arising in your back yard..
Now I have to make an admission here. I have spent my professional career working with insecticides – trying to find out how they kill insects, how insects become resistant to them, and generally studying their toxic effects in both insects and mammals. I regard them as useful tools rather than the devil’s work, but tools that demand respect – as you might be careful working with axes, chain saws and tall ladders. With any reasonable care they are quite safe to use (protect hands and eyes, and if any significant amount of the concentrate gets on your skin, wash it off within a few minutes). So I have no problem with using chemical controls for the borer. Others do have these concerns for various reasons, but unfortunately, there are few, if any, effective alternatives for anyone growing a significant number of irises. I still use the old reliable Cygon (common name dimethoate), a plant systemic insecticide from the older organophosphate class. “Systemic” means that the insecticide is absorbed into the plant and kills the insect as it feeds on the plant tissues. 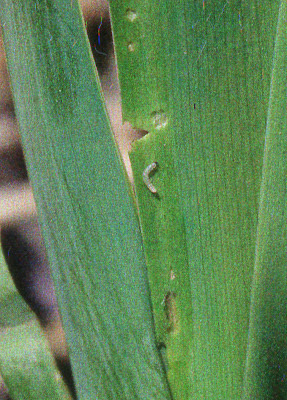 The borer caterpillar’s habit of rapidly heading inside the iris leaves makes the use of non-systemic insecticides inefficient – the larvae are only exposed on the surface for a short time and thereafter surface insecticide residues don’t affect them. You can see this in the first photo where the larva was already feeding on the leaf margin inside the sheath before these were separated to reveal it at work. Their sneaky cryptic behavior probably helps to protect them from natural controls like parasites and predators too. Cygon remains very effective for us, but in 2002, in the overall drive by the US Environmental Protection Agency to reduce the use of organophosphates, it was restricted to use by commercial producers and it is not now available for homeowners. It does have moderate toxicity to humans and it did have a record of causing poisoning symptoms (no fatalities) in homeowners, primarily through contact with the concentrated compound (and failure to remove it expeditiously), so that limitation was justified, although I would rather have an accident with Cygon than with a chainsaw where the average number of stitches required afterwards is about 110 (that's not made up, it's Consumer Product Safety Commission data). Mostly Cygon has been replaced for borer control by a newer and safer compound, Merit (the common name is imidacloprid – these names are shown in the list of active ingredients on the label). This is essentially a synthetic analog of the old (and now defunct) natural insecticide, nicotine. Imidacloprid is a very widely used insecticide worldwide. Its big advantage is that whereas nicotine was a dangerous compound to use (I know two colleagues who spilled liquid nicotine on themselves during class demonstrations and in both cases ended up with a trip to hospital. That's why I use a video and not a real life demo of its effects). It is very active in affecting the human nervous system and, as a liquid, is rapidly absorbed through the skin. Imidacloprid is very poor at affecting vertebrate nerves but much better at affecting those of many insects which makes it safe to the user and is just what you want in an insecticide, and it has excellent plant systemic activity. Unfortunately my experience after a couple of trials with imidacloprid is that it isn’t all that great at controlling borers. This really isn’t too surprising since its best activity is against sucking insects such as aphids, whiteflies and thrips. It is generally less impressive in controlling caterpillars such as our borers. Others seem to find it OK though, and use it regularly. There is not a lot of choice. However, the main problem with imidacloprid (and there are several other insecticides in the same class) is that it may be implicated in the ongoing decline of honey bee populations (colony collapse disorder). This is a problem at several levels, but at the top of the list is that the loss of bees as pollinators threatens the production of many crops in US.. This is not the place to get into this complicated and contentious topic. Certainly imidacloprid and like compounds are highly toxic to bees, but if they are centrally involved in this problem, it is probably not through direct toxicity, but more likely by altering bee behavior and navigation, or their sensitivity to pathogens. Most experts feel that they are only a part of the problem and may not even be the major one. For example, episodes of what looks like honey bee colony collapse were being reported in the US and UK in the 19th century, long before imidacloprid was ever used, and it appears to be occurring in other parts of the world where these compounds have never been used. And in some countries where these compounds are used, no reliable reports of colony collapse seem to have been established. Viruses, other pathogens, mites that feed on bees, and stress from the frequent movement of bee colonies around the US as pollinators, as well as these insecticides, have all been invoked without establishing a clear smoking gun – and so if there is a single reason for the decline it has yet to be established. Perhaps there is a combination of stresses here with some insecticides as one possible component of yet unknown significance. Some current thought suggests that imidacloprid can make bees more sensitive to pathogens, but this doesn’t explain all the observations. The mystery remains, as do suspicions about these insecticides, and for that reason, their future use is under a cloud. So, the possible involvement of imidacloprid and its relatives in the honey bee decline phenomenon raises some concerns about its use for borer control – are these insects safe as we enjoy watching them collect iris pollen or nectar? Currently there are no really effective alternatives available to the iris grower, but there may be cause for hope around the corner. A new class of insecticides that paralyze insect muscles (and not mammalian ones) has recently been developed and they are just now coming into use. These have excellent activity against caterpillars and seem quite safe to honey bees. The first, with the un-pronounceable common name of chlorantraniliprole, is now showing up at garden centers in some grub control products. In this use it replaces imidacloprid. Although I’m not aware of any specific test that have been published, the more systemically-active members of this group are likely to be excellent for borer control. Now we need someone to run these studies to find out, and if they are effective, let's hope that they are introduced for use in gardens in the near future to replace Cygon and imidacloprid. Although I have no real problems with Cygon, safer is surely better, you can hopefully worry less about bees if you are now using Merit -- and Cygon really does smell bad! I've used chlorantraniliprole (rynaxypyr) for caterpillars and beetles, and is very effective. We've conducted a trial for adults of Anomala vitis and it was 99.9% effective. It is only good for insects having a chewing mouth (caterpillars, borers, beetles). Yes, that's the first of these new compounds on the market and it might even be systemic enough for borer control. I'm hoping someone will run a study to find out for sure. Another analog that is strongly systemic is cyazypyr (cyantraniliprole). I believe this should be going commercial sometime next year. My guess is that it, or even ryanaxypy, could become the compound of choice for borer control.